The Oval shaped face is a bit longer and this face shape looks closely to an egg. It has a wider forehead, shorter jawline, and a rounded chin feature. Guys with the oval face are so lucky when it comes to hairstyles because almost every hairstyle fits the oval shaped face. Though, let your hair stay away from your forehead since this will make your face looks rounder. If you have straight or wavy hair you can keep it short or long and have it pushed back. For curly hair, you could keep it short and cropped with lines at the sides and back or in a faded style. The Oval shaped face is known as the all-rounder. It is because almost all hairstyles look good with men that have this face shape. One of the best hairstyles that suit oval shape is the short side parting. One of the best hairstyles that suit oval shape is the short side parting. It is the easiest and quickest hairstyle you can have and will make you look neat and classy. Want to know how to get the perfect side-parted hairstyle? Don’t worry, we have your back with that. 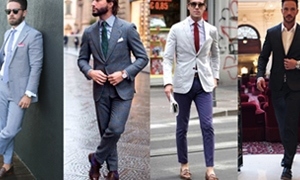 Here are our 10 best ways on how to wear it. When it comes to trendy hairstyles, fringe up is on the top of the list. This hairstyle adds a little bit to your height and it shows an upscale look. You can style it in any way you want depending on your preference. Grab your favorite dry hair wax and stick your hair up or to the side. Long hair pushed back is so easy to keep and very flexible style. Normally, just push or comb the hair backwards but the length of the hair will let you style it in different ways. If you want to have this hairstyle it doesn’t matter if you won’t visit your barber that often. Pompadour works well with Oval shaped faces. This will make your features longer and balances the width. Pompadour can be done with naturally curly or straight hair. You just need to have the top a little longer in order to style it and you can also have the sides longer or not, it depends on your preference. To achieve a nice pompadour hairstyle just comb your hair back or to the sides. You can also apply wax to your hair to make it steady. Check out our article on how to get Pompadour hairstyle just like the iconic Brad Pitt. The spiky hairstyle would surely fit oval-shaped face since this will make your face a bit thinner. It is also good to add a bit of volume on the hair but just make sure that the hair on the sides are not too short to balance out the length and width of your face. Try to apply wax or pomade to keep the spikes in place for a long time. Taper fade with quiff is the most stylish hairstyle nowadays. The fade is gradually from one length to another and it doesn’t disconnect like the other faded hairstyle. If you have a long hair then you can totally add a quiff into it to make it more stylish and to even the width of your face. This hairstyle also works well with short hair so don’t worry guys, you can still achieve this look perfectly. This is one of the most interesting hairstyles. The mid fade behind the ears is shorter while the medium hair is volumized and tousled. You can combine it with pompadour hairstyle to make it more fashionable. We all know pompadour can be achieved with any kinds of hair – curly, wavy or straight. Here are our 33 best ways on how to style your Pompadour haircut. The undercut has also been popular for guys with the oval face. This hairstyle will highlight your face a little but that wouldn’t be a problem because you can try to grow some short beard with it to make it look more classy and stylish. The undercut is so easy to style but of course, you need to maintain and keep it neat. Comb over hairstyle has narrow sides and smooth volumized top that makes the hair a bit longer and balances out the width of your forehead. Keep your hair a little longer so that you can style it up and apply some lightweight pomade or wax to keep it in place. This hairstyle is a great option if you opt to balance out the proportion of your face. The slicked hair at the back looks classy and the volume at the top gives symmetry to the width and the length of your face.